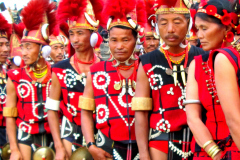 Known for its mystical hills and warrior tribes, Nagaland, which is one of the seven northeastern states in the India, is relatively new to the tourism scene in the country but its Hornbill Festival has gained worldwide fame in just a few years. Although most of the present day Naga people have converted to Christianity, they take great pride in their tribal culture, and there’s no better place to experience their unique traditions than at the annual Hornbill Festival that takes place from the 1st to the 10th of December. Starting out in 2003 as a Government sponsored event for promoting tourism in the region, the Hornbill Festival has grown over the years to become an international event that is visited by both domestic and foreign tourists. 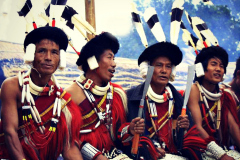 The festival showcases the social and culture aspects of the sixteen recognized tribes and is named after the colorful and majestic Hornbill, which inhabits the region and is an integral part of the social and cultural life of the tribes. The bird features in folklore, folk songs, dances and even the multi-hued and exotic tribal costumes. The Heritage Village, Kisama, which is the permanent venue for the festival is around 12 kilometers away from the state capital, Kohima. Its name is derived from the two neighboring villages – Kigwema and Phesama. A cluster of sixteen houses in the complex, belonging to the recognized tribes in the state is the highlight of the festival. Each house or morung is built using architectural features that are unique to a particular tribe. It also has its own restaurant. Similarly, the customs and traditions of each tribe are different to that of another, and can be witnessed at the cultural performances that are a part of the festival. The colorful spectacle of dances, songs and narratives create a vibrant and memorable event, which keeps alive the tribal culture by passing down their history and way of life to the next generation. 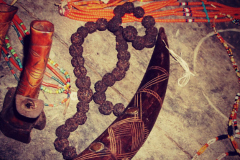 An experience that is treasured by most tourists is that of interacting with the elders in the tribal huts. The younger Nagas, most of whom speak English, play the role of interpreters translating the conversation between tourists and the tribal elders. 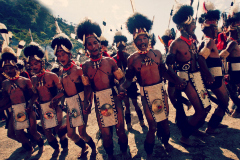 The Hornbill Festival is not just about culture, music and dance. For food lovers, especially non-vegetarians, it’s a gastronomic delight. 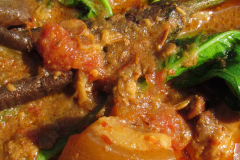 Since, traditionally, the Nagas were hunters; meat is a staple in most meals. Pork and beef are the most popular meats that are served in the morung restaurants and are used in momos or served as side dishes along with rice. Dishes are often spiced with the famous Naga Jolokia chilli, which is one of the hottest peppers in the world. Vegetarians will not be disappointed either with unusual dishes made from bamboo shoot or yam leaves and the sticky rice tea. 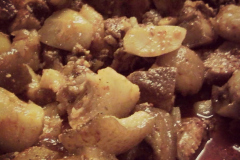 Dishes are usually washed down with cold rice beer or Zutho. The festivities include several competitions, the most interesting among them being the Chili eating competition and local sports such as catching the piglet and climbing up a slippery oiled pole. Besides this, there is a music competition, the Hornbill Literature Festival, Photography contest, marathon, motor rally and a special World War II car rally. One of the highlights of the festival is the rock music competition, which is often referred to as the Woodstock of Northeast India. Bands from across the country participate in the grand event, and some bands even come in from places outside India, including Australia, Nepal and the UAE, among others. 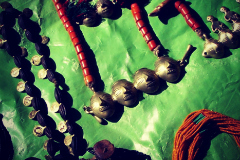 For travelers who like to pick up souvenirs or handicrafts, stalls in the village display a range of products. From paintings and pictures of birds to bamboo utensils, hand woven fabric, colorful Naga shawls, masks and other bamboo artifacts. Visitors to Nagaland during the Hornbill Festival can find accommodation in a range of hotels, guesthouses and home stays in Kohima. The latter option presents the opportunity of staying with a Naga family and enjoying home cooked Naga food, besides observing at close quarters their customs and traditions. For first time visitors, the Hornbill Festival is exciting with its myriad of colors, music, dances and unusual cuisine. No guide book or feature does justice to the vibrant atmosphere that prevails in the heritage village during the ten days of the festival. That’s one of the reasons for its popularity as visitors who have experienced it once, usually go back for more in the subsequent years.